Papaya is one of the most delicious fruits and most favored fruits for all kids and adults alike, its consistency and color are so much appealing for all of us, the good thing is that, it is available all through the year, papaya is very rich with Antioxidants and fibers as well as vitamins and minerals that make it among the healthiest fruits you can consume, it also carry many beauty benefits so it can be made a part of your daily beauty regime, the following are five of the countless beauty benefits of papaya, so read on. 1- It Nourishes The Skin. Papaya is rich with vitamin A which is important for the skin, it also contain the papain enzyme which helps to nourish and moisturize the skin, it is a common ingredient in most of the home face packs, the best way to prepare it is by adding just teaspoon of honey and mash it up to make a face mask that hydrate, deeply nourish and moisturize your skin specially in the cold weather where the skin needs extra hydration. 2- Papaya Conditions The Hair. Papaya is not just great for your skin but your hair too, its butter like consistency helps to soften and moisturize the hair while treating split ends and preventing hair fall, mashed papaya can be mixed with honey and almond oil for even more benefit, you can creat your hair treatment mask, add it to your hair for an hour before you shampoo your hair and enjoy soft and shiny hair that is deeply nourished. 3- Papaya Treats Cracked Heels. Papaya has the ability to get rid of dead skin cells and deeply hydrate dehydrated cells, which make it ideal to treat cracked heels, you can make a paste out of freshly mashed papaya mixed with banana and Honey, apply the mixture on your cracked heels, cover with cling film and then put on your socks and go to sleep, in the morning wash off your feet with lukewarm water and repeat this process twice a week, you will be fascinated of the quick results. Papaya co tain a type of acid called Alfa-Hydroxy, this acid makes the fruit act as a natural topical antibiotic which helps to fight off bad bacteria on your skin which is the main cause of acnes, it will also nourish the skin and prevent acne scars, for this purpose, mix freshly mashed papaya with vitamin E oil and vitamin C, apply the mixture on the affected area for five minutes then wash off with warm water and a proper face cleanser. 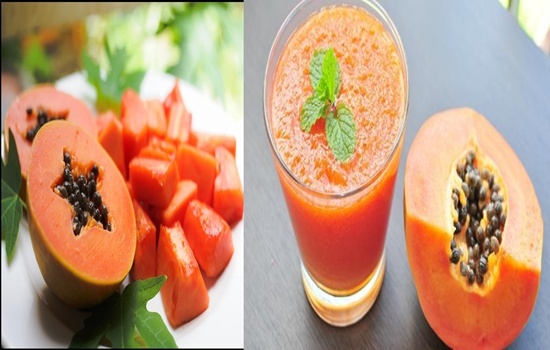 5- Papaya Reduces Pigmentation And Dark Spots. Papaya works wonders to reduce pigmentation marks and dark spots on the skin that could be caused by over exposure to the sun rays without applying sun protection, papaya when mixed with milk work greatly to enhance the completion and tone the skin color, in fact it can even prevent tanning to a certain extent. 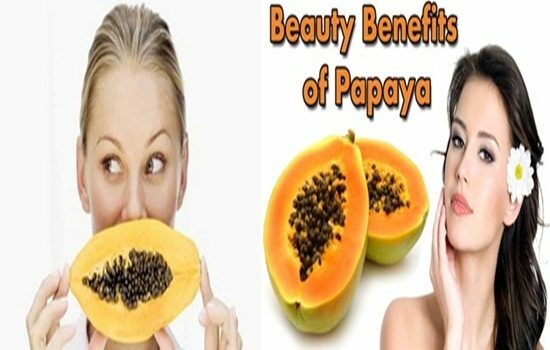 Papaya is a great and a healthy choice when eaten and it works its way out to make your skin look wonderful, however the tips we presented above are to gain even more benefits of papaya by applying it topically.